This link will take you to the site of the annual winter getaway in Cape May, New Jersey. Here I am in a Borders Books and Music in Columbus, Ohio in 1996. Guruji Sri Chinmoy lifts me and my colleague, Dr. Carol Brown at the ceremony for the "Lifting up the World with a Oneness Heart" award. I have just returned from Murphy Writing Seminars' annual getaway abroad--this year in Dundee, Scotland. There I help conduct feedback sessions while myself participating in Peter Murphy's seminars and writing. Join us next summer in a warm place--to be announced--very likely L'Avenc in Catalunya, Spain! We were there 2 years ago, and it was fantastic! For info see www.murphywriting.com. I thought I'd better add a recent photo, so here's one--of me reading my poem, "Frog Prince" in Dundee, Scotland, August, 2016. Text entered here will wrap around the left or right-aligned image. 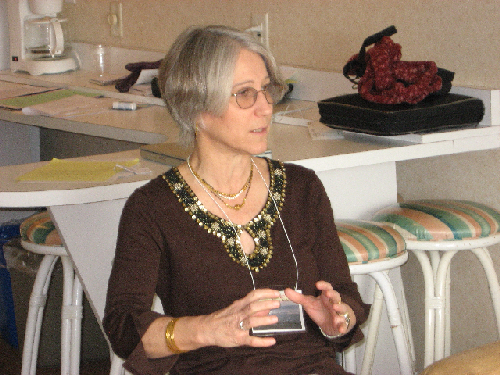 Here I am conducting a workshop in "revising your short story for publication" in winter 2006 at the Cape May Winter Getaway. 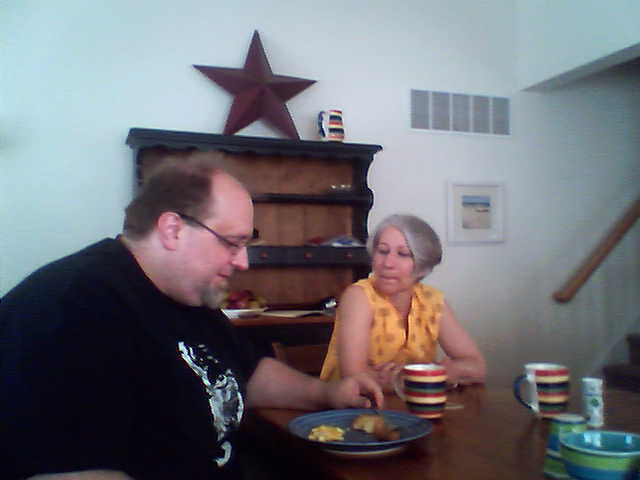 Me and Richard Weems conferring about our fiction at breakfast at a retreat for the staff of the Cape May Getaway. Here I am with Weems and another member of the Cape May Winter Getaway staff, Charles Lynch, at another of our staff meetings. ENG 303 Creative Writing Poetry taught online in the summer of 2007 resulted in an anthology of student poems I compiled from students' portfolios. Please click on the link to the left to see a copy. I also take private students on a variety of projects from poetry to short fiction to long fiction!